Acupuncture can benefit all life stages (juvenile, adult and senior) and a variety of conditions. Determining and resolving the underlying reasons illness are occurring is one of the aspects of this approach that can reduce the cumulative effect of chronic illness. Since most pets’ health problems are diagnosed once illness has become very advanced, it’s vital to strive to prevent disease from occurring. Veterinary acupuncture improves tissue blood flow, oxygenation and removal of metabolic wastes and toxins. The goal of acupuncture is to promote the body to heal itself. Acupuncture enhances blood circulation, nervous system stimulation, and the release of anti-inflammatory and pain relieving hormones. 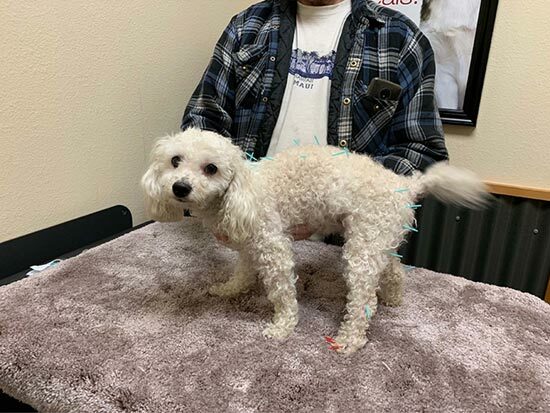 For owners who are contemplating acupuncture, this is one success story that you might want to read. This adorable little guy is Boomer; pictured with his dad, Dan. Boomer was paralyzed in the lower half of his body when came to us a month ago and was unable to empty his bladder or bowels on his own. We began acupuncture treatments and by the 3rd visit Boomer was beginning to stand and urinate a little on his own. After 6 treatments, not only was he standing, but running and urinating/defecating on his own! While his movement isn't 100% restored, Dr. Morris and staff are thrilled with the result! This is just one example of how acupuncture can work to improve motor function in animals with Intervertebral Disk Disease and/or neurological deficits.